If your Assignments page includes a Roll Call Attendance assignment, your instructor is taking attendance in your course. 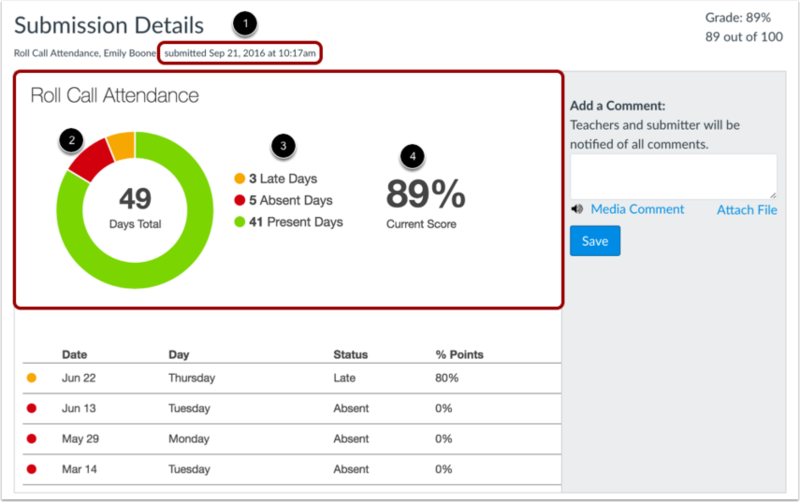 As part of the assignment, you can view your attendance record in your course. Like any other Canvas assignment, you can also view or leave comments in the submission details page. If the Roll Call Attendance assignment is available to you, this lesson shows you how to view your attendance report through the Grades page. 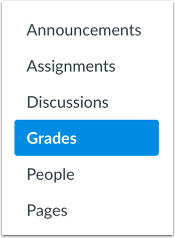 However, if your instructor allows you to view the Assignments link in Course Navigation, you can also access the submission details through the Assignments page by opening the Attendance assignment. Note: If the Roll Call Attendance assignment does not appear in the Grades page, your instructor has chosen to not use Attendance for grading. Click the name of the Roll Call Attendance assignment. The first time you view the Roll Call Attendance assignment, you must authorize your account. Click the Authorize button. The submission details shows the first date that your instructor took attendance in your course . You can also view an overview of your attendance record through a graph , with the graph key displayed to the right . Attendance is identified by color, where green shows the days you were on time and present, yellow shows the days you were late, and red shows the days you were absent. You can also view the total percentage of days you have been marked as on time in your class . Below the overview information, you can also view the specific days that you were marked late or absent. 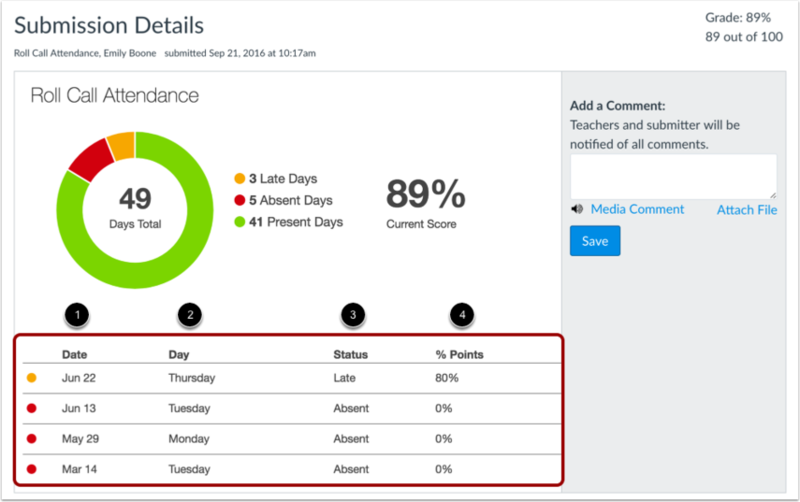 For each attendance record, you can view the date , day of the week , status , and percentage points earned . Previous Topic:How do I view rubric results for my assignment? Next Topic:How do I download assignment submissions from all my courses? Table of Contents > Assignments > How do I view my Roll Call Attendance report as a student?